Bring a small saucepan of water to the boil. Add half a lemon and a pinch of salt and pepper. Place the salmon in boiling water, then reduce the heat and gently poach for 8 to 10 minutes, until cooked through. Transfer the fish to a plate and allow to cool. Place the chickpeas in a large bowl. Add the pomegranate seeds, orange juice, lime juice and the juice of the remaining lemon. Mix in the olive oil and season with salt and pepper. Flake the cooled salmon into the bowl and toss gently to combine. 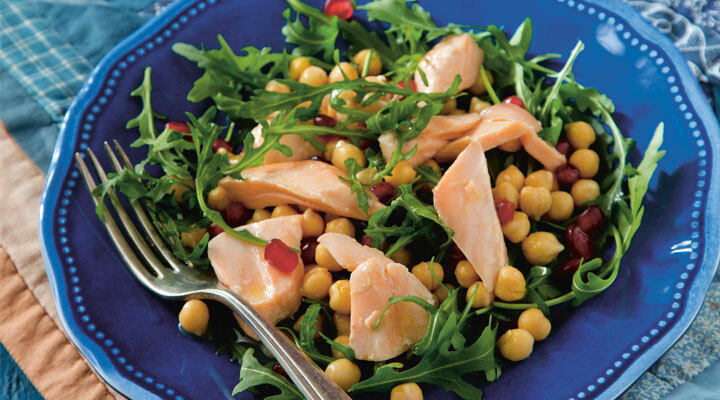 To serve, place a handful of rocket leaves on each plate, then top with the salmon and chickpea salad.